Text by Cody Hooper, Photos by Jon Crowley Danny Adair and Cody Hooper. Dont Let the Big Dunes Scare You. If youve been down to Glamis in recent years, youve probably seen the signs, trucks, and banners for Idaho Dunes RV in Saint Anthony, Idaho. Strange that someone would market a dune getaway nearly 950 miles from its location- but somehow, it has worked. 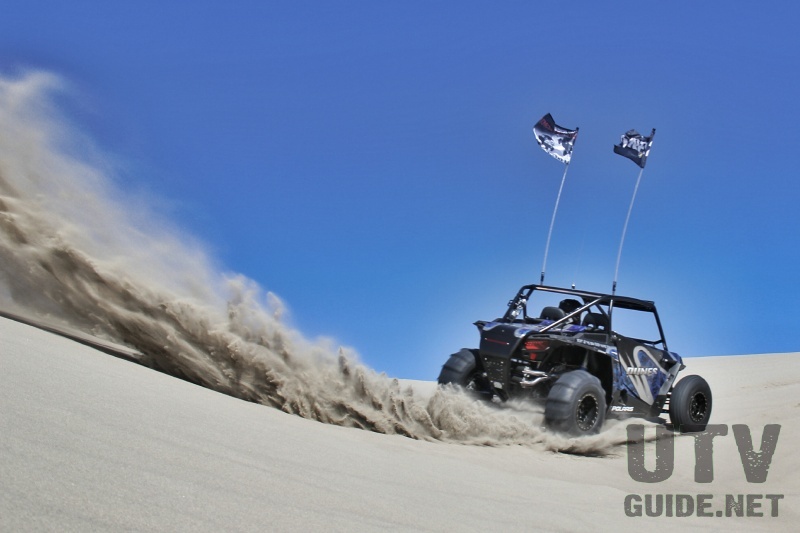 At the recent UTV Invasion, which was based out of Idaho Dunes RV in Saint Anthony, Idaho, we ran into quite a few Southern California-based Glamis goers. Mike McGroarty, the owner of the Idaho Dunes RV park, lives in Norco, California, just outside Riverside. Quite the commute, if you ask us, but his dedicated staff up at the RV site keeps things running smoothly year-round. 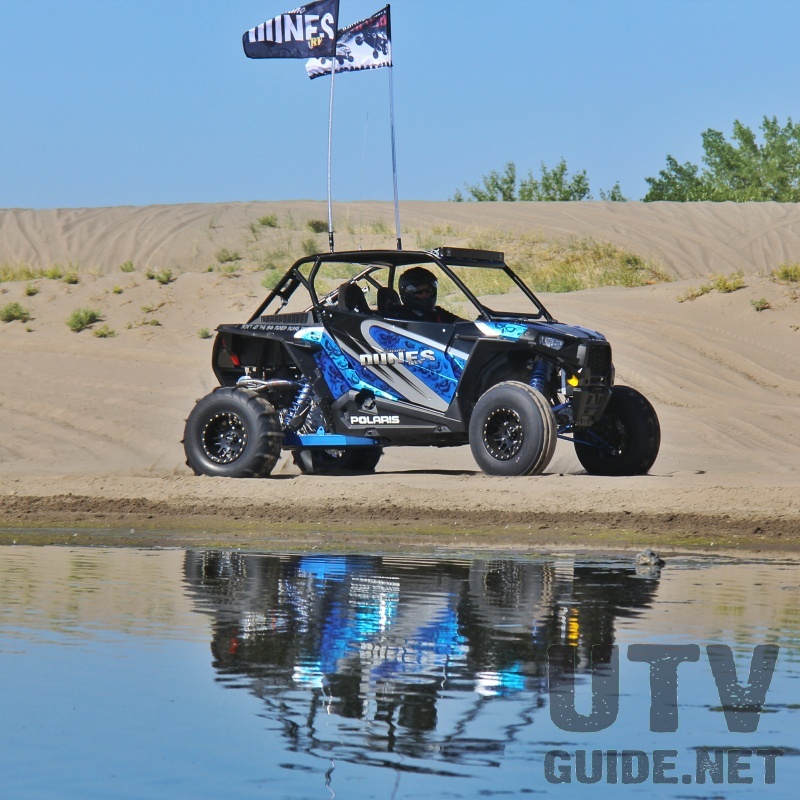 Mike is a duner, just like many of us UTV Guide fans, but was always behind the helm of big sand cars. So for UTV Invasion, we had to get him in a RZR! The whole build was performed and facilitated by SDR Motorsports in Corona, California. SDR is one of the premier UTV coach building shops in the world right now, shipping complete custom vehicles all over the globe. 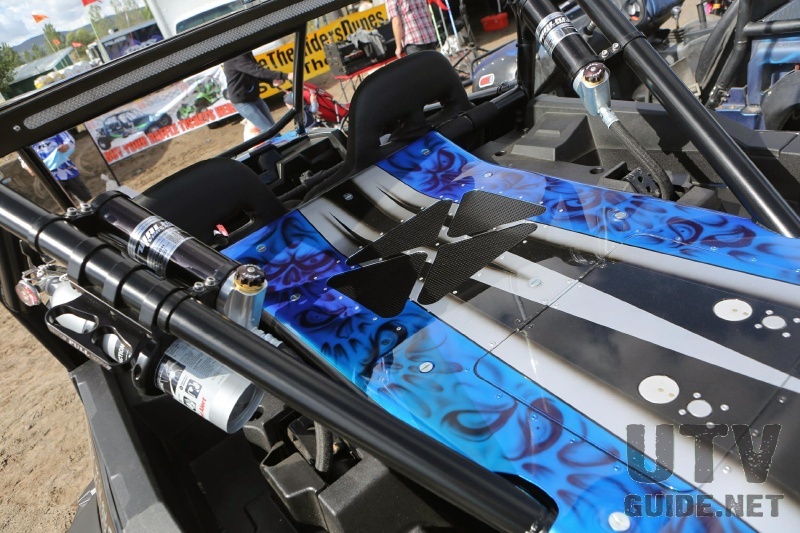 SDR started with a 2014 RZR XP 1000 2 seater, and stripped it down to the bare frame. They started with their Betsy series XPR-2 cage, powdercoated black. A set of their full-coverage opening doors were added, which cover up a beautiful set of Twisted Stitch TS-R seats and four-point harnesses. Stitching for the seats was color-matched to the custom paint and powdercoat work to tie the whole build together. Inside the car, the dash is filled SDR switchwork and the air/fuel ratio gauge hooked up to the Muzzy Gen 4 tuner. The tuning system is plugged in to the factory ECU/Injector harness, allowing the Muzzy controller to change the fuel deliver to their own specifications. Tuning is monitored by an oxygen sensor bolted into the exhaust system, which allows the controller to calculate how much fuel it needs to feed the engine. 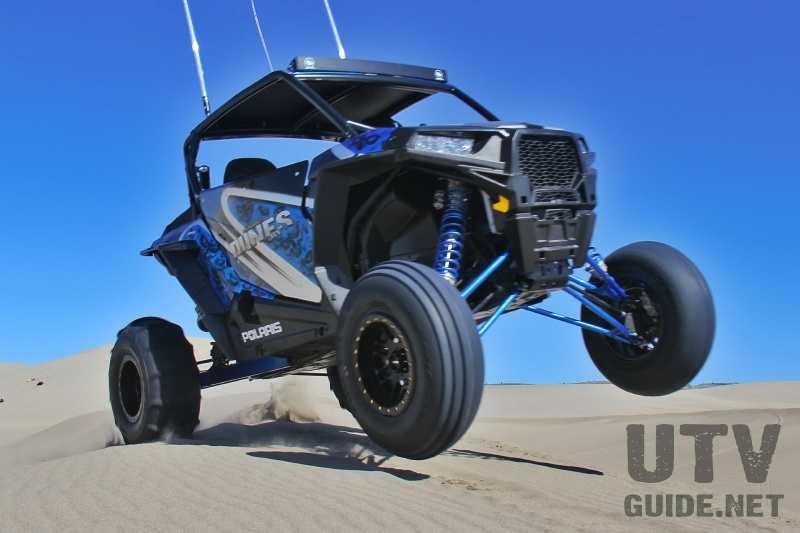 The Muzzy exhaust and fuel controller give a 10-12% advantage in horsepower over the stock setup, letting Mikes lightweight build lift the front end over big rollers in the dunes with ease. The Muzzys exhaust system uses a 2-1-2 header system that merges into a large collector that is fine-tuned to produce massive power. The dual mufflers not only look and sound great, but are quiet as well- as low as 94 dB depending on how you have the inserts configured. 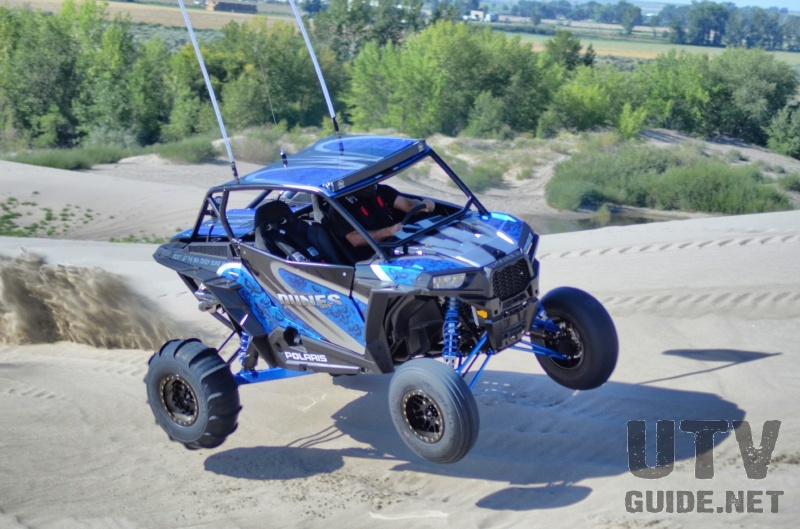 Lighting up Mikes custom Idaho Dunes RV RZR is a beautiful Baja Designs OnX ARC Series LED light bar, as well as a pair of Safe Glo whips bolted up top. The OnX series light bars use Baja Designs user-configurable reflector technology to give the same lighting distance as an 8 HID, a claimed first for an LED light bar. While we havent tested them back-to-back, we can say the OnX bar is VERY bright. Its slim look is complimented well by SDRs notched roof, which allows the top of the light bar to sit almost level with the roof line. It is mounted up out of the drivers line of sight, which really helps outward visibility in steep dune transitions. The Safe Glo whips are 6 feet long, using 200 LEDs to produce a very bright lighted whip antenna. The whips mount with an aluminum base and a steel threaded shaft for durability. Putting the power to the ground are a set of Sand Tires Unlimited 28 #1 cut 16 paddle rear tires wrapped around Method 406 sand wheels. The aluminum beadlock wheels look fantastic, and keep the STU paddles bolted securely to the wheel, even at low tire pressures. Up front, a set of 28 STU Razor Blasters allow Mike to put the car exactly where he wants it. Fullerton Sand Sports is your #1 source for in-stock sand tires, and their expertise in matching a tire to your car is unbeatable. The A-arms and springs were all removed and sent out for color matched powder coat, done in a rich candy blue color. Smith Design, a company based in Menifee, California, handled all of the custom paintwork. The beautiful candy blue and black ghost skull paint matches Mikes turbo V8 sand car, and it looks downright gorgeous in the Idaho sun. 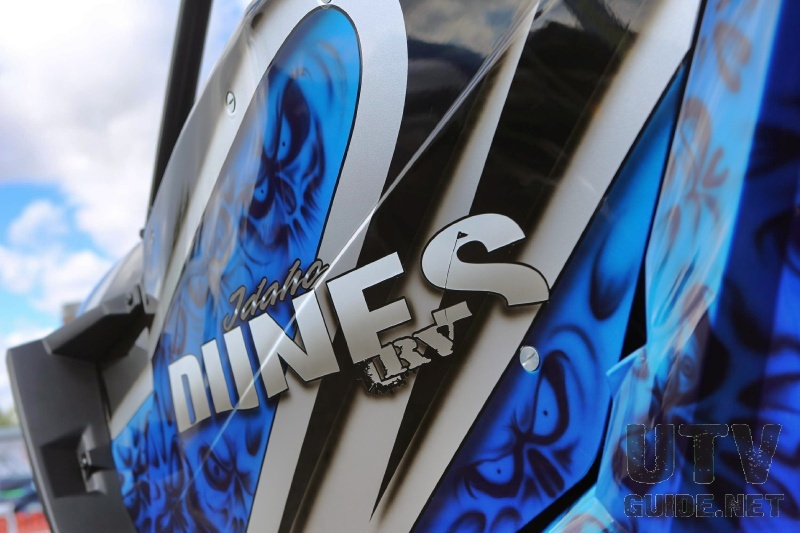 The Idaho Dunes RV logo and slogan (Dont Let the Big Dunes Scare You) are painted on the car, giving a custom and slightly promotional look to the tricked-out RZR. 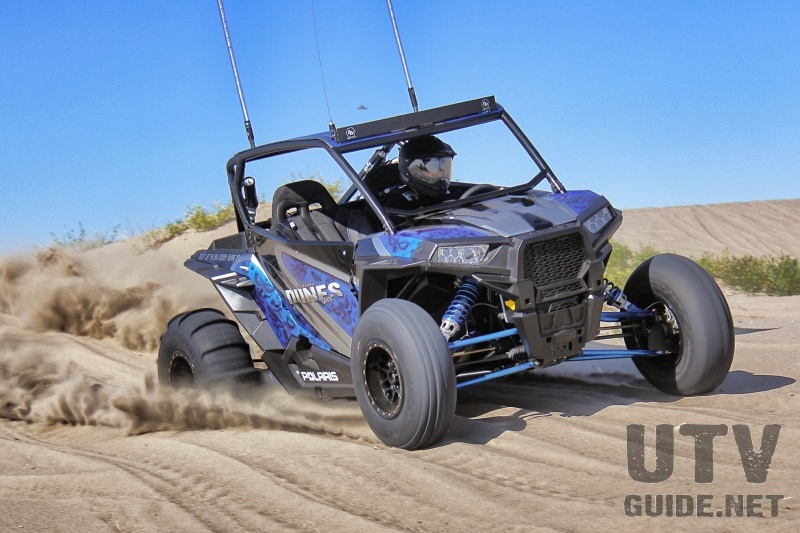 We watched Mike blast his new RZR around St. Anthony all week, and he was having a blast- the lightweight build was fast, handled extremely well, and captured many admiring looks in the dunes and back at camp. 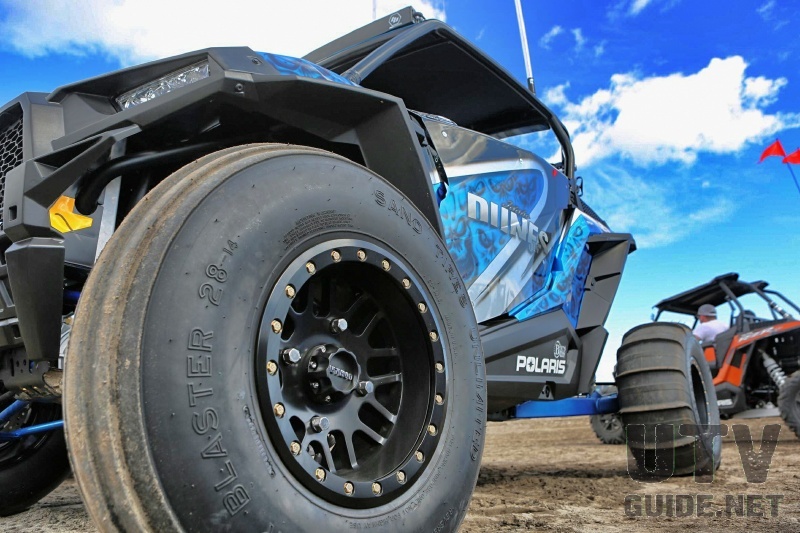 For information on building your own tricked out RZR, visit the websites of the companies that helped build this one below!